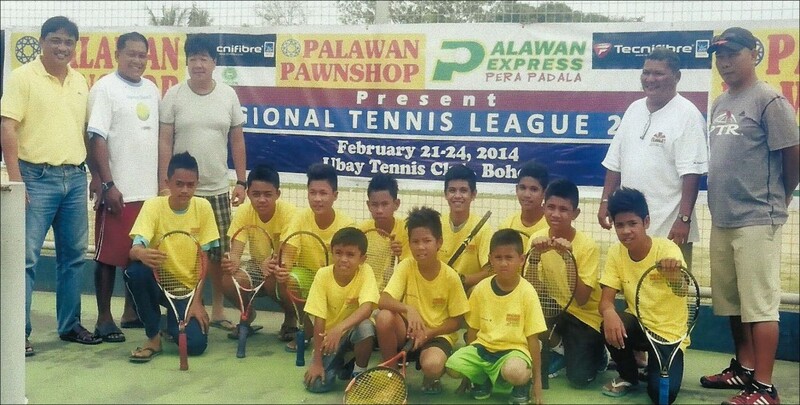 Jagnaanon tennis players bring home prizes in the February 21-24, 2014 Palawan Pawnshop, Palawan Express Pera Padala, Tecnifibre sponsored Regional Tennis League 2014 held at the Ubay Tennis Club in Ubay, Bohol. Tennis champs are Rosel Cero (14 under); Randy Labor (12 under); Eugene Mabatoan (16 under) and Randy Labor (14 under). Earl John Mendez is a semi-finalist in the 10 under category while Lester Labor is a runner-up in the 14 under category and JR Magallano in the 12 under category. Head Coach/Trainor is Mr. Emmanuel Cero and Mr. Rolando Damolo is the assistant coach/trainor. The Jagnaanon tennis players were supported by the Local Government Unit. (l to r standing) Jagna SB Member Leonardo A. Ocio, Jr., Asst. Coach Roland Damolo, Philta Regional Vice President (Region 7-B) Mr. T-ngardz Uy, Head Coach Mr. Emmanuel Cero and Palawan Pawnshop Director Bobby Mangunay. (seated l to r) Bannie Acebes, Gabriel Acebes, Insect Labor, Earl John Mendez, Eugene Mabatuan, Randy Labor, Benjie Tadena, JR Magallano, Rosel Cero, RG Magallano and Lester Labor.